Despite the overwhelmingly, at times, the informative world we live in, it is most surprising to hear and learn how people across the world, less fortunate than us live. And more than that – what little basic needs they lack that that we take for granted on daily basis. The lasting impact they have on their entire lives. Meeting Lily Chong at a recent industry event and the story that unfolded from our conversation stayed with me for a long time. She was working on an idea that will ultimately lead to the launch of an ethical underwear brand that will help women in Africa with basic necessities that most of us ladies assume everyone has within arms reach. We are proud to bring this story to you and give you an opportunity to make a difference. Tell me a little bit about you and Sarah, your co-founder. How did you two meet? Sarah and I met in Uganda, where we both ran the International Marathon in 2016 and were volunteering on the local projects the race supported. A particular project was the Women’s Soroptimists Masaka, a group of women who work for the security and empowerment of women across the Masaka region. These women made sanitary pads from banana leaves. They sell and distribute them to local ladies, to maintain their hygiene and dignity. Sadly, many do not have the underwear to place them in. Did either of you have any fashion background prior to launching Y.O.U Underwear? No, neither Sarah or I have a fashion background. We both come from corporate roles. I had a career in corporate sales and Sarah had a career in digital marketing. Why did you think that the best way to help would be through launching a fashion brand? For the past few years, I’ve been a passionate advocate for driving social change through business. It was inevitable when the issue came to light that we will address the problem with a business approach. We understood, the fashion industry is the second most polluted industry in the world (second to the oil industry). But underwear is the basic necessity that everyone puts on each day. It means everyone could potentially be helping others less fortunate, by simply wearing on every day their underwear. There are two groups: The people in need. That’s the children and women in Africa who don’t have access to their own or clean underwear on a daily basis, including those from orphanages, slums, school and hospitals. Secondly, we realized that more and more people are becoming more conscious about sustainability issues and our planet. We want to provide this group of people with the opportunity to have an impact on peoples lives and see instantly the benefits of their involvement. What other ideas did you consider as a means to help raise awareness of this problem and why did you reject them? One of the first ideas we had and considered was using tech for made to measures bras. However, after some research, we realized the technology and industry weren’t quite there, and it also required a higher capital investment. So, we discounted it. Talk us through the thinking process when you both decided to launch an ethical underwear label? We pivoted away from made to measure bras but underwear remained the topic we had interest in. We continued to ask questions, like what customers wanted from their underwear and what kind of business and impact we wanted to have. We learned that there was a lack of ethical underwear at an affordable price. People are paying more attention to who made their clothes. They care about what they put in their bodies as well as what’s on their body too. That is how Y.O.U came about – providing ethical underwear for men and women. Y.O.U stands for “Your Own Underwear”. We believe everyone should have it. When you decided to launch an ethical underwear label – what examples did you have in mind that you wanted to follow and aspire to be like? We want to be known as an ethical underwear label that appeals to both men and women. A “lingerie” by definition is underwear for women only. We wanted to create classic everyday basics, non-fussy with a clean design. Something that would make you feel good. And ultimately products that will be durable, comfortable and that our clients will be proud to put on every day. I think we have achieved that. What was the biggest challenge you faced in setting up your label? Sarah and I had to learn quickly about the fashion and garment industry. We didn’t even know where to begin to make our first samples. We didn’t know what a tech pack was even. We are still learning as we go each day. It’s taken us a full year from when we had the idea to start the business to launching Y.O.U ethical underwear now. How did you find the factory to make your samples and production? Where is it located? What are the biggest struggles or challenges you faced in the process of “idea to product”? The biggest struggle has been the time. Each revision we make to the designs takes time – to reiterate back and forth. However, to have beautiful finished products in the end, that we are proud of – these were the vital steps. What challenges did you have to get to where you are today? So far it is the crowdfunding, which itself is a full-time job. How have you financed this project so far? So far, the projects have been self-funded. We are currently running a crowdfunding campaign on Kickstarter to help us get our first collection to market. We will be delighted If people will support us. It is a funding platform where we offering rewards in return for money to help turn our brand mission into reality. We are aiming to raise £20,000 in the next 13 days, it is an all or nothing campaign, which means that if we don’t hit the target you don’t pay. Please visit our page and pledge support. The campaign closes on 11th December. Some of the money you make from sales will be donated to a charity that helps women in Africa. How did you find this charity and what made you partner up with them? 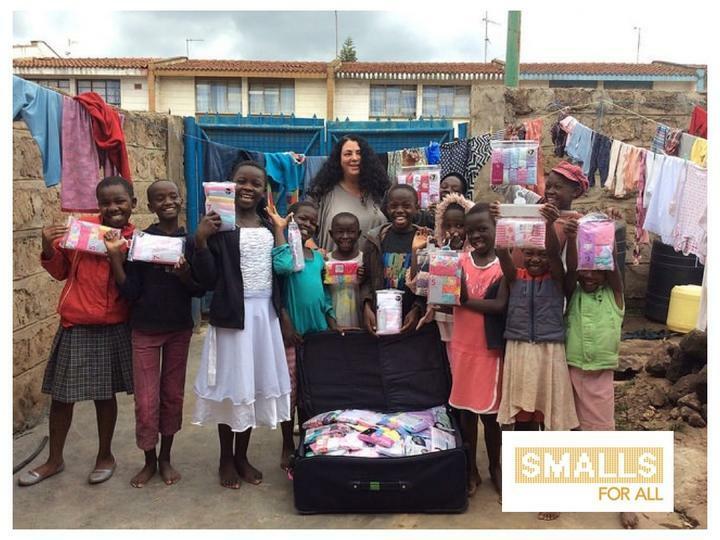 I was aware of Smalls for All as a charity from my previous work. When the idea came, they instantly came to mind. We contacted them initially to find out if and how we can support them. To begin with, we started doing bra collections at our events. As the business formed, we approached them about being our charity partner, as it was clear that we had a common objective. We are committed to giving a percentage of our revenue, equal to the type of a “buy one give one” model. Some people are skeptical about brands linking up to charities and question of the money the charities get will actually reach those in need. What steps will you take to ensure that is not the case for you? We want to have transparency in our business, where customers do understand the impact they are having. It will include building a system of impact reporting and communication with our customers. We will focus on developing relationships and visiting our giving partners, in the UK and abroad, to ensure our end-end giving on the ground are met. What impact will your brand have on the women you are trying to help? By providing the basics necessity of underwear, it will mean young girls and women will no longer need to miss out on their education because of their periods. They can feel safe and protected and not be excluded from their work or communities. It will maintain their basic health, hygiene, and dignity, so they can feel confident and empowered in what they do. What advise would you give to anyone who, like you, has come across an issue that has had an impact on them and they want to do something about it? I think it’s important to understand the real issues you are trying to solve. Spend as much time as possible with the people affected by being on the ground, do your customer research and think about how sustainable is your solution. What advise would you give to anyone who is thinking of launching a fashion label? Understand what you want to create and who for, prepare to work hard, learn and listen, and stay resilient! What is the best advice anyone has given you that has helped you on your journey so far? If you don’t build your dream, someone else is going to hire you to build theirs. If you would like to learn more about Sarah and Lily’s journey and brand – visit their website. To help them make a difference to countless girls lives – support them by pledging support in their crowdfunding campaign.